Barbara Guggenheim is a partner in Guggenheim, Asher Associates, Inc., one of America’s best-known firms of art consultants. 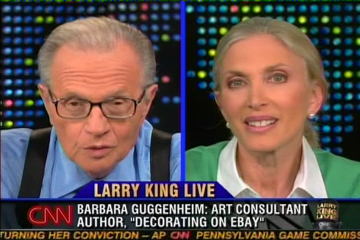 Barbara has been the subject of numerous magazine articles, including two profiles in Vanity Fair, and an interview on Larry King Live. As a writer, Barbara contributes humor to W, ELLE, and HARPER’S BAZAAR. She is also a contributor to THE HUFFINGTON POST and THE DAILY BEAST. With offices in New York and Los Angeles, Barbara lives a bicoastal life.